(Santa Ana, California) – The Astronauts Memorial Foundation (www.amfcse.org) has expanded its partnership with Professional Coin Grading Service (www.PCGS.com) to offer an exclusive label hand-signed by Apollo 11 Astronaut Buzz Aldrin for select Apollo 11 50th Anniversary Commemorative Coins. The US Mint's Apollo 11 50th Anniversary Coin Program was created to honor the 50th anniversary of the Apollo 11 mission, the first to land a man on the moon. The reverse of the 50th Anniversary Coins features a representation of the famous "Buzz Aldrin on the Moon" photograph. Now lucky collectors can purchase this coin from The Astronauts Memorial Foundation with an authentic signature by the world-famous astronaut featured on it. Joe Orlando, CEO of Collectors Universe, Inc. stated "Partnering with the Astronauts Memorial Foundation has been a pleasure. PCGS and AMF are very excited to add yet another option for space exploration collectors and numismatists to consider. Attaching an iconic figure like Buzz Aldrin to this special coin product gives it the kind of appeal that can attract collectors from all genres. One could argue that no other name in space exploration history is more recognizable." The coins provided to PCGS for grading and encapsulation with this unique label are from AMF's limited allocation from the Launch Ceremony where the first coins were sold. In addition to having Aldrin's signature, these coins will carry the First Day of Issue Launch Ceremony pedigree. Only coins that were purchased at the official ceremony on January 24, 2019 are eligible for this exclusive pedigree. 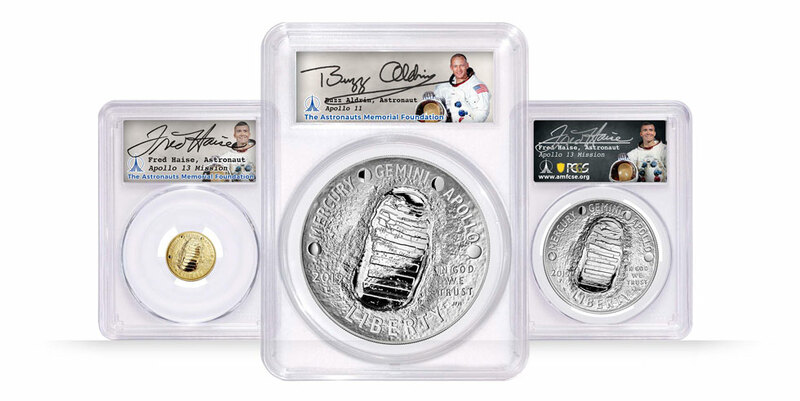 In addition to Apollo 11 astronaut Buzz Aldrin, PCGS and AMF have also certified coins with Apollo 13 astronaut Fred Haise. Coins featuring both Aldrin and Haise signatures are available at https://www.amfcse.org/apollo-11-50th-anniversary-commemorative-coin-program-2019. Proceeds from the sale of these coins go to further The Astronaut Memorial Foundation's goals of paying tribute to our fallen astronauts and inspiring future generations of scientists, technologies, engineers, and mathematicians. Since its founding in 1986, PCGS experts have certified over 41 million coins from over 100 different countries with a total market value of over $35.1 billion. For information about PCGS products and services, including how to submit your coins for authentication and grading, visit www.PCGS.com or call PCGS Customer Service at (800) 447-8848.